Location: The walls run W along White Lion Street from corner of Upper Frog St, and then S along South Parade and St Florence Parade to the sea. Medieval town walls extending the full original length from the cliff above the South Beach, along St Florence Parade and South Parade to the corner at White Lion Street, and thence returning towards the cliff over the North Beach. 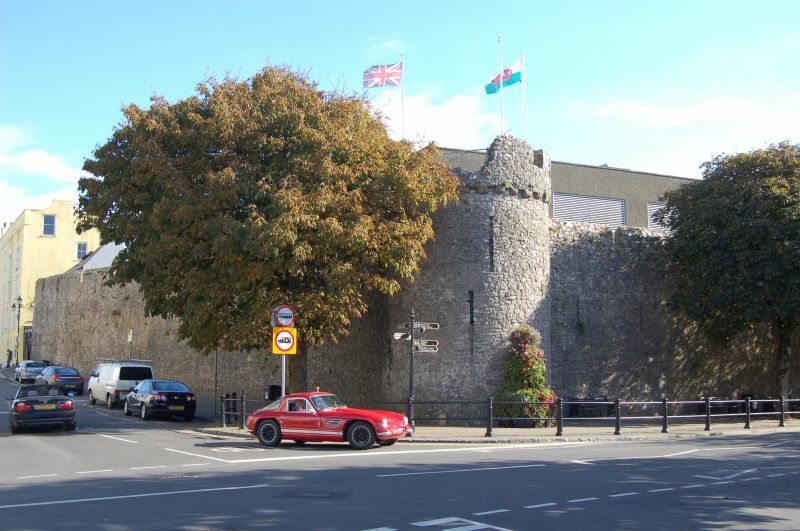 This short return is shortened by the loss of the Great or Carmarthen Gate (removed 1781), and connecting wall on the site of the Royal Lion Hotel. There were also walls around the harbour area and linking to the Castle, now gone. The walls may have been begun under the Marshals, Earls of Pembroke to 1245, replacing an earthen rampart of the late C12, and have been completed after Tenby was sacked in 1260 by Llewelyn ap Gruffydd, the later work for William de Valence, Earl from 1247 to 1291. Much rebuilt in 1457 for Jasper Tudor, at which time the walls were said to have been badly built and maintained, and to require both raising and widening all around for a wall walk. The evidence of raising by some 5' (1.5m) at this time can clearly be seen, and the wall walk was mostly still intact in 1812, but largely removed in the early C19. A fragment survives behind York House, Lower Frog Street. There was a moat along the whole length. Only the Five Arches survives of the town gates. The Belmont Arch was cut through to The Paragon in the 1860s by the Earl of Limerick to give carriage access to Belmont Houses, now the Imperial Hotel. Town walls with 6 towers and one large semicircular town gate. Rubble stone with arrow loops and crenellated parapet. Short length along White Lion Street to circular bastion at corner of South Parade and then main long length down to the sea with various towers: semi-circular bastion half-way along South Parade, Five Arches gateway opposite former R C convent, semi-circular bastion opposite the garage at S end of South Parade (the interior infilled by Tower Cottage, Lower Frog Street), square tower on St Florence Parade (backing onto garden of No 4 Frogmore Terrace), semi-circular bastion built up in C19 as round tower on W end of the Imperial Hotel and finally a small battered square tower on the cliff edge. Graded I as one of the most important surviving medieval city walls in Britain. N P Scheduled Ancient Monument Cadw Ref 16/2073/PE007 (PEM) R.
Situated on the S side of St George's Street next to the town wall. Situated on the S side of St George's Street between the junction with Lower Frog Street and the town wall. Situated towards W end between the Olde Gifte Shoppe and premises occupied by Five Arches Gifts. Situated near the junction of St George's Street and Lower Frog Street. Situated on the W side of St Florence Parade opposite the town wall just S of the entrance to St George's Street. Situated just N of the Church of the Holy Rood and St Teilo, opposite the town walls. On the S side of the junction of South Parade, Upper Park Road and Trafalgar Road. On the W side of Upper Frog Street some 25m N of the junction with St George's Street.